Pumpkin Exfoliating Mask contains nourishing Pumpkin Puree combined with Pineapple and Carrot Juice to clear away old surface cells and pore congestion. Frankincense Essential Oil and Vitamins A and E encourage cell production. Cell damage and dark patches are reduced for a brighter, even more luminous complexion. 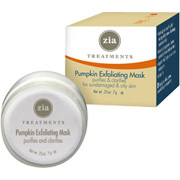 Pumpkin Exfoliating Mask Trial Size - 0.25 oz., (Zia Natural) is shipped in a discrete, unmarked package. Orders are processed immediately and usually takes about 3 to 5 working days to be received. We do ask that you try it for 2 to 3 weeks to feel the full effects. Any information received is used only for order processing and shipping purposes. Your information, such as e-mail address, will never be disclosed to a third party.